Bill Halderman – An outlaw, he was hanged with his brother Tom in Tombstone, Arizona on November 16, 1900, for killing a man. Tom Halderman – An outlaw, he was hanged with his brother Bill in Tombstone, Arizona on November 16, 1900, for killing a man. “Haltbreek Jack” – An outlaw, he was lynched near Yellowstone by the Montana Stranglers in 1884 for rustling cattle. Bill Hall – An Arizona outlaw, he was the first prisoner of Yuma Prison in 1875. Caleb Hall, aka: The Prowler, John Collins, Sam Collins (18? ?-1935) – A former John Kinney Gang member, he fought in New Mexico’s Lincoln County War. Silas Hampton (1868-1887) – Near the town of Tishomingo, Oklahoma, 18-year-old Cherokee Indian, Silas Hampton, robbed and killed a farmer by the name of Abner N. Lloyd on December 9, 1886. Having made off with only $7.50, the foolish young man purchased a bright red handkerchief and a few other small items which he proudly displayed to his friends. He was soon arrested and as he was led away, he pleaded with the marshals, “Don’t take me to Fort Smith; kill me right now!” His pleading was to no avail. He was soon shipped off to Fort Smith, where he was found guilty by Judge Isaac Parker. He was hanged on October 7, 1887. Orlando Camillo Hanks, aka: Charley Jones, Deaf Charley (1863-1902) – An outlaw and the last and toughest of Butch Cassidy’s Wild Bunch. He robbed trains in Montana and New Mexico from the 1880s. He was killed in 1902 by Sheriff Pink Taylor after killing a lawman. John Wesley (Wes) Hardin (1853-1895) – Known as Texas’ most deadly gunman, Hardin killed over thirty people. After spending 18 years in prison, he was shot and killed on August 19, 1895, by John Henry Selman. 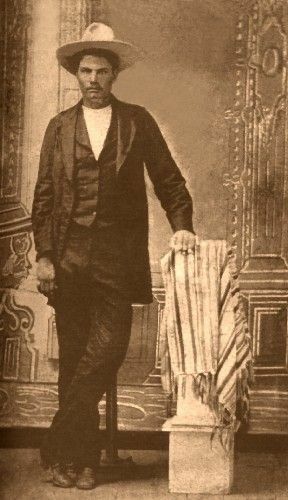 Joseph “Joe” Hardin – The brother of John Wesley Hardin, he was also an outlaw and was lynched in June 1874. Mart Hardin – An outlaw charged with conspiracy in the murder of Bud Frazer, who was killed by Jim Miller in 1893. John Jefferson Harlin, aka: Off Wheeler – An outlaw, Harlin was one of the many bad men who were run out of Las Vegas, New Mexico. 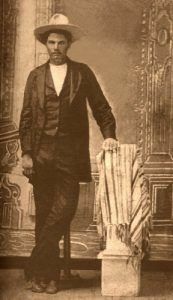 Adolf Harmon – An outlaw, he was shot and killed by Gabriel Gonzolez ten years after Harmon killed Deputy Sheriff Esteban Trujillo on January 22, 1897. Augustin Harmon – A gunman, Harmon was sentenced to twenty-five years in prison for killing Ricardo Lovato of Springer, New Mexico. Harpe Brothers – Murderous outlaws who operated in Tennessee, Kentucky, and Illinois in the late 1700s, they are said to have been America’s first serial killers. Chas Harper – An outlaw and member of the Plummer gang, was hanged at Florence, Idaho, in 1891. Charles A. “Jack” Harris – A saloon keeper and highwayman, Jack Harris paraded as a good citizen but, was secretly robbing stagecoaches in Nevada. Edward Hart – A former John Kinney Gang member, he fought in New Mexico’s Lincoln County War Afterwards, he joined Selman’s Scouts, a vicious gang who terrorized the county. He was shot and killed by John Selman in Lincoln County in September 1878 for allegedly attempting to assume the role of gang leader. Splay Foot Hartnett – An outlaw, he was lynched by the Montana Stranglers in 1884. Pearl Hart, aka: Pearl Bywater, Pearl Taylor, Mrs. L.P. Keele (1871-19??) 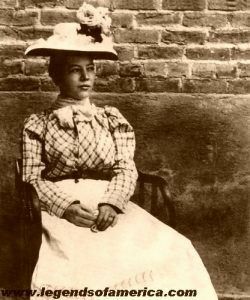 – Hart was one of the only female stagecoach robbers in the American West. L. B. Hasbrouck (18? ?-1874) – A horse thief operating in Kansas, Hasbrouck was captured with several other horse thieves near Caldwell, Kansas. Hauled to jail to await trial, a lynch mob stormed the Caldwell jail on July 29, 1874, and lynched Hasbrouck, along with two other horse thieves by the names of William “Billy” L. Brooks and Charlie Smith. Sam Hasley – An outlaw, he killed several men and joined the war against the Texas reconstructionists in Bell County. Henry Hawkins – Led a band of outlaws named the “Mesa Hawks,” robbing trains in the New Mexico Territory in 1897. C.B. Hawley (18? ?-1882) – An outlaw, Hawley confessed to stagecoach robbery in 1882 near Globe, Arizona and was lynched. Harry Head, aka: Harry the Kid (18? ?-1881) – A cattle rustler and stage robber in southern Arizona, Head was known to hang out with the likes of the Clanton Gang. He was killed while trying to rob a store.